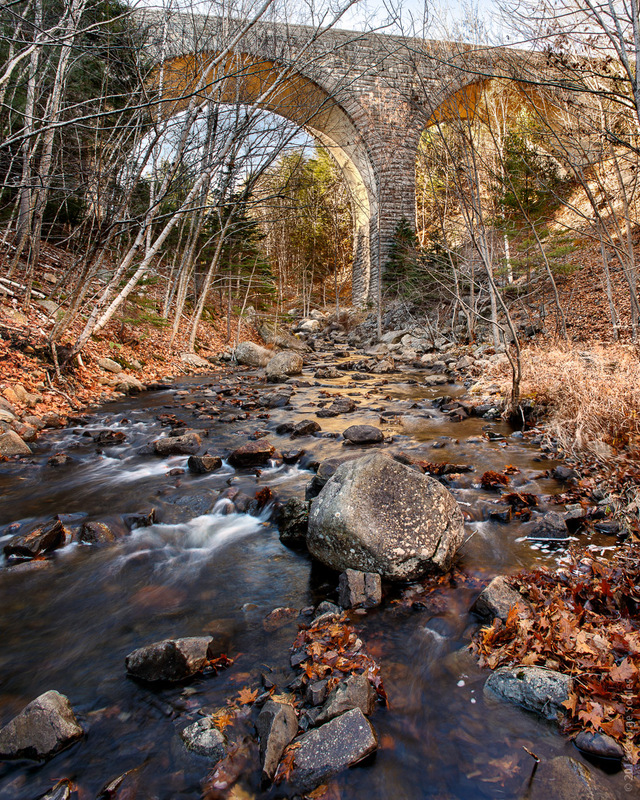 The largest bridge that you've probably never seen on Mount Desert Island is the Duck Brook Motor Road Bridge pictured below. Ironically, anyone who drives the Park Loop Road, starting from the Hulls Cove Visitor Center, travels over the bridge (located here), but few people see the bridge itself. That's too bad since it is by far the longest and tallest bridge in the park. In fact, it's the largest continuous concrete arch deck bridge in the eastern United States. At 402' long (not counting the 65' approaches on each side) and having a center arch span of 95', it dwarfs every carriage road bridge in the park, the longest being Amphitheater at 245' and the tallest being Duck Brook at 43' (yes, there are two Duck Brook bridges, one for people and bikes, and this one for cars). An architectural drawing of the bridge indicates a height of 100' from the top of the 30" high parapet guardwall to the water below. That drawing and other information about the history and construction of the bridge come from the Library of Congress Prints and Photographs Online Catalog. So how does the largest road-related structure in Acadia National Park go unnoticed? There are three reasons. First, from above you might not realize you are driving over a bridge because the roadway and shoulders look much like other portions of the loop road. If you happen to park at the turnout located southeast of the bridge, then walk atop the bridge and look over the side, you only get a glimpse of the three stone arches. To really see them, you have to hike down to the brook, but there is no trail and the terrain is dangerously steep. Second, the only view from below is along the narrow and busy stretch of Route 3 between Sonogee and the Holiday Inn. At 40 mph, you wouldn't see the bridge even if you knew the exact instant when and where to look. Finally, from below, the bridge is almost entirely obscured in summer by deciduous trees growing in the deep ravine that the bridge spans. To see this magnificent structure which was constructed from 1950 to 1953 using granite from Hall Quarry in Somesville, you have to seek it out at the right time of year. To get the photo below, I waited until late fall after the leaves were gone. I parked at the Holiday Inn which was closed for the season and walked across Route 3 to the metal guard rail along the section of road that crosses Duck Brook. Once in the ravine, I located a spot at the edge of the water that I thought had the clearest view of the bridge, and even from there I could only see two of the three arches. The left and right arches each span 89', but in the photo, the left arch is completely obscured by evergreens. I set up a tripod with a Canon 5D Mark III camera and a Canon 24mm tilt/shift lens. With the camera mounted in landscape orientation, I shifted the lens all the way down to capture the lower part of the scene and all the way up to catch the top of the bridge. Because the ravine was deep in shadow while the inner part of the center arch was in full sunlight, I had to take multiple exposures ranging from a half second to 125th second, which is seven full stops, at f/11 with ISO set to 50. Later in Lightroom and Photoshop, I stitched the lower and upper halves and manually blended the exposures. Note also that I focused on the bridge, but also took a shot focused on the large rock in the foreground and blended-in parts of that image to get more depth of field. The Duck Brook Motor Road Bridge is truly a hidden architectural and historical gem. John D. Rockefeller purchased the land for the Paradise Hill Road where the bridge is located, donated the land to to the park, and was involved in planning the road as early as 1934, but World War II and subsequent funding shortages delayed the start of construction. As many as 75 men were on the job at one time with total labor estimated at 92,000 hours. Total cost of the structure was $366,000 making it the most expensive road-related structure in the park at the time of its completion.